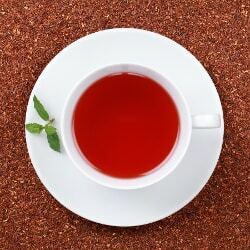 Red, or rooibos, tea is perhaps the most overlooked of all teas. It has been a staple of South African culture for centuries, but has only recently begun to take off in Western countries. If your loose leaf tea chest doesn’t have a single rooibos tea blend in it, you really are missing out. It not only has a unique and delicious nutty flavor, but also contains a whole host of essential vitamins, minerals and antioxidants. Here are 3 great reasons to drink more rooibos tea. 1. It does not contain caffeine. How many times have you reached for your loose leaf tea chest in eager anticipation, only to realize that it was too late in the evening for a cup of tea? Well, since rooibos leaves are naturally caffeine-free, you can enjoy a cup of red tea at any time of the day or night without having to worry about affecting your sleep. This is ideal for tea drinkers who love the calming effect of warm tea but hate the caffeine high. 2. It may help prevent cancer. According to the World Cancer Research Fund, there were over 14 million cancer cases worldwide last year. Cancer is not something anyone likes to think about, but as the saying goes, prevention is better than the cure and by making appropriate changes to your lifestyle you could heighten your chances of staying cancer-free. The Medical Research Council of South Africa conducted studies on rooibos tea and found that rooibos tea helps to fight mutagenesis (the mutation of cells caused by exposure to carcinogenic agents) which is a precursor to many forms of cancer. They also discovered that rooibos tea helps to promote enzyme action in the liver so that carcinogens are broken down faster. You can read more about the cancer-prevention effects of rooibos tea at this link. 3. It contains healthy minerals. Rooibos tea is stuffed with minerals that are vital for good health. For example, it’s very rich in manganese which helps promote healthy bones and teeth. It also contains iron, which is essential for healthy circulatory function. Modern diets are often severely lacking in these nutrients and drinking rooibos tea is a good way to make sure you’re consuming enough minerals. That being said, rooibos tea alone is no substitute for a healthy, well-rounded diet, so if you suspect you’re suffering from a nutritional deficiency, always seek medical advice. The next time your reserves of loose leaf tea are running low, why not make an order for some South African rooibos tea?